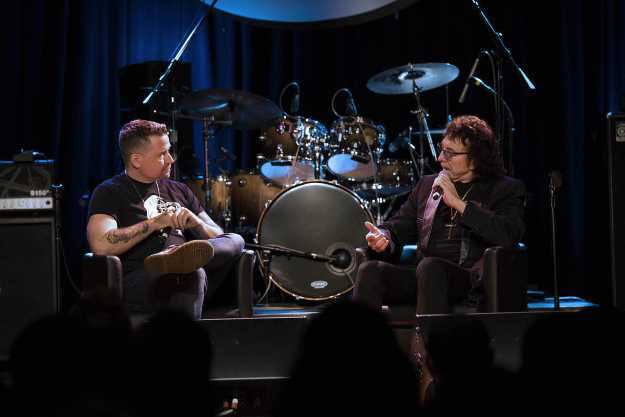 Before making his appearance at the 2017 Loudwire Music Awards on Oct. 24 to accept the Courage Award, Tony Iommi sat down with Ryan J. Downey at a Musicians Institute exclusive conversation in Los Angeles on Monday (Oct. 23). Speaking for about an hour before taking questions from the audience, the legendary Black Sabbath guitarist and heavy metal pioneer talked about his childhood and his relationship with music growing up, the accident that ultimately led to the birth of metal, the formation of Black Sabbath as well as the band's chart-topping comeback with Ozzy Osbourne, 13. 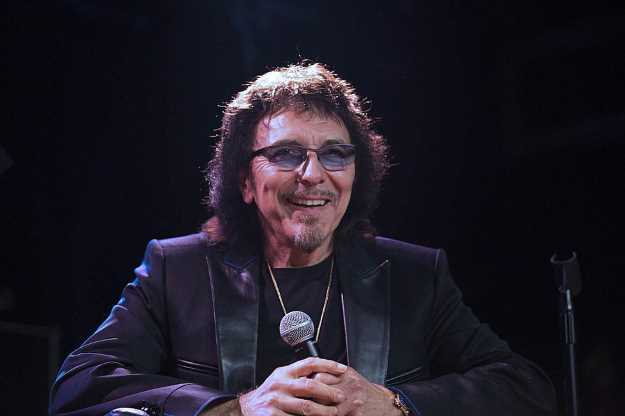 Turning back the clock to over a half century ago, Iommi discussed growing up in the industrial city of Birmingham, England which was plagued by gangs and he later saw music as a means of escaping that lifestyle. Bullied as a kid, Iommi was once chased down the road by a spider-wielding neighbor, leading to an accident where the future icon tripped, scarring his face after sliding on the gravel. With a scar on his upper lip, he made the decision to mask it by growing a mustache, a distinctive facial feature he's retained to this day. In response to the bullying, Iommi took up Judo three-to-four times a week and practiced karate as well. Though once music entered the picture, these training sessions became increasingly infrequent and ultimately fell by the wayside altogether as he became enamored by guitarist Hank Marvin from the instrumentalist group The Shadows. Iommi called them the top instrumental band in England, joking that the country only had one to begin with. While fans can't imagine the Black Sabbath legend without his Gibson SG, the guitar wasn't the musician's first dream. With ambitions to become a drummer, Iommi faced two problems that prevented him from putting sticks in his hand: his house was too small for a kit and he was unable to afford one anyway. Fortunately for all of us, it was the guitar that became his calling card as he listened to The Shadows, learning their music by ear and he commented that guitar playing comes from the inside rather than what's written and that you have to play what you feel. For all those who have slaved over a guitar trying to capture the inimitable mood and magic of Iommi's riffs, there lies your hurdle. In the '60s when Iommi first picked up a guitar, he didn't have limitless choices or the ability to pull a Gibson or Fender off a wall at a local music shop, but had to order the rare left-handed guitar from a catalog for £30. He would later have a variety of options when Sabbath eventually made it to the U.S. and he was able to peruse a finer selection in New York. Of course, what conversation with Tony Iommi would be complete without bringing up the would-be-fortunate machine accident that resulted in the severing of a couple fingertips on the guitarist's fretting hand? We all know the tale, but hearing it told straight from Iommi's mouth is an altogether surreal experience. Working as a welder in a factory, which he commented was "a good job if you like jobs," Iommi recalled his co-worker failing to report to work, so he was put to work behind a metal-bending press on his last day on the job before leaving for a tour of Germany. Returning home for lunch and hoping it would be for good, Iommi was implored by his mother to finish the job and during the waning hours of his shift the accident happened. When the guillotine-like press came down, a less than attentive Iommi neglected to withdraw his hand fully from the chopping block and the press severed two of his fingertips. He described the gruesome scene with bones protruding from the ends of his fingers, which were then cut off as he sought urgent care at the hospital. "Of course my mother got total blame for that," he quipped, able to laugh about the injury after nearly half a century of rock stardom. Doctors told him, "You might as well forget playing [guitar]," and a glum Iommi refused to accept his new fate and insisted there had to be some way to combat this devastating mutilation. The lightning bolt of inspiration struck when his factory manager handed him an EP from Django Reinhardt, who also dealt with an accident to his hand. Determined to once again play the guitar, plastic bottles were melted into a ball and a hot soldering iron bored a hole through it, allowing the condensed ball to be laid over the damaged fingertips. Days went by as Iommi rubbed the caps down to make the shape of a finger and when they were ready, he attempted to play again, but his ambition was met with agonizing pain and he was incapable of performing string bends, which was all too problematic when wailing on the blues. After trying to wrap the caps in various textiles, the guitarist decided to cut up his leather jacket and glued bits of the material over the caps and a grip on the strings was now attainable, though fretting the instrument still proved to be difficult as he lacked the ability to feel the guitar's neck. Still in the rudimentary phase of customizing his guitar to counter his injury, Iommi filed the frets down on his guitar, minimizing the amount of physical pressure required to play. The standard gauge strings also proved to be troubling and he then went in pursuit of lighter gauge strings, settling on ones typically used on a banjo, surprisingly enough. He'd later attempt to secure lighter guitar strings through various companies, but was laughed away and told they'd never sell — oops. You're probably wondering where Black Sabbath fits into this picture. It's now. Prior to teaming up with Geezer Butler (who was originally a guitarist!) and Ozzy Osbourne, Iommi joined a band near Scotland and pulled in his former The Rest bandmate and remarkable skinsman Bill Ward. The two would later return to Birmingham, scouring local advertisements in music shops, where they came across one that read "Ozzy requires gig." Iommi thought to himself that it couldn't be the same Ozzy from his school days and was puzzled as he never knew him to be a singer, to which he smirked, "I was right, wasn't I?" The pair of musicians, in need of a singer, answered the ad and went knocking on Ozzy's door, where his mother answered. "Forget it, I know him," Iommi said to Ward. Fatefully, Ozzy, who was linked up with Butler at the time, came looking for a drummer and Ward said he wouldn't accept without Iommi joining and one of the most esteemed lineups in the history of recorded music was born. Sabotage cover. Vertigo / Warner Bros. This lineup would endure a number of early problems, like Butler playing bass lines on a Telecaster at a gig and later a three-string bass. "Oi, your singer's crap," shouted someone at a show, which featured Butler in a hippie dress, Iommi and Ward sporting leather jackets and a barefooted Osbourne. 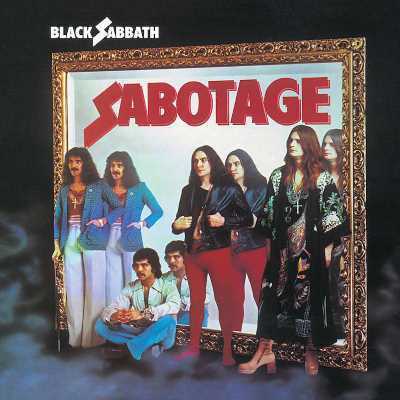 Confusing didn't even touch what was going on and the befuddling wardrobe selection would manifest itself again in 1975 on the front and back covers of Sabotage. As they honed their sound (and, mercifully, their appearance), Black Sabbath weren't initially met with rave reviews recognizing the musical revolution that would soon follow as Iommi's heaving riffs would live in eternal glory. Rolling Stone slagged the band's haunting 1970 debut and Sabbath struggled to obtain gigs in their home country, but had built up a dedicated following in Germany, often playing upwards of seven 45-minute sets a day. The band would stretch their material to its absolute limits, jamming onstage (which is how "War Pigs" came to be) while Iommi would play extended solos during one set and Ward would get his turn in another. The club organizers weren't overjoyed by this and put the kibosh on the excessive and over-indulgent musicianship, not that it wasn't standard practice for some of the world's leading rock acts ... but Sabbath had yet to reach that point. The history of Sabbath from this point on is well-documented and Ryan J. Downey fast forwarded the conversation to the band's 13 album, which was their first studio record to feature Ozzy since 1978's fateful Never Say Die. For decades, Iommi had been the band's leader and pointman when it came to recording new albums and he gleefully relinquished this role as Rick Rubin was tasked with the production. His vision was to mentally transport the band back to the time of their debut record, gathering them all to listen to it before the writing sessions started. Rubin was not bent on just a mental throwback, however, and asked Iommi if he could get his old amplifiers used from Sabbath's heyday. The guitarist declined, pointing out that he now has his own amp, which houses his perfected tone. Unswayed, Rubin insisted on vintage and had a stack of amps at his house for Iommi to plug into. However, he stressed to Rubin that just because they're "vintage" doesn't mean they sound great — they're just old, underscoring the subtle and sarcastic wit that lies beneath the collected and dignified persona of heavy metal's godfather. Thanks to the Musicians Institute and Ryan J. Downey for hosting the conversation series with Tony Iommi in Los Angeles. For more information on the Musicians Institute College of Contemporary Music, visit their website and stay up to date with all things Tony Iommi by following the guitarist on Facebook.